"A thick hearty pancake that melts in your mouth." Combine buttermilk, flour, sugar, farina, oil, egg, vanilla extract, baking powder, baking soda, and salt in a bowl. Beat using an electric mixer on low until just combined. Heat a lightly oiled griddle over medium-low heat. Drop batter by large spoonfuls onto the griddle and cook until middle is set, about 4 minutes. Flip and cook until golden brown on the other side, 3 to 5 minutes. Repeat with remaining batter. Move over, potato pancakes! Try Chef John's super easy and crispy farro cakes. The flavor was ok but the texture was to heavy. No I would not try it again. 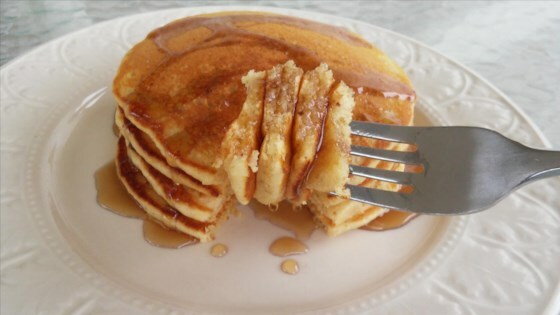 I love these pancakes, I make a batch and freeze leftover pancakes for future breakfasts for my DH. They reheat beautifully and are still light and moist. Best of all they mix up in a hurry. Fantastic melt in your mouth pancakes! These pancakes were light and fluffy- it will be my go to recipe for pancakes from now on.